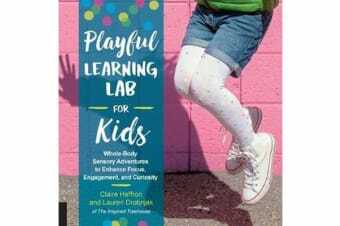 Playful Learning Lab for Kids is a hands-on activity book that offers games and activities that revolve around the senses and concepts in reading, math, art, and science. Recent research has shown that children learn and develop new skills more quickly when they engage in playful, whole body activities. Movement allows them to refocus their attention, improves brain function, reduces stress, and improves circulation. Not only that, but the more senses that are used for learning, the more likely information is to be stored and retrieved. The activities in Playful Learning Lab for Kids explore concepts in reading, language, math, art, music, science, geography, and social studies, all while engaging children with movements, touch, sound, and sight. Most distinguishing of all, the activities and lessons here include suggestions for tailoring the experience to different levels, making it a book children can grow with. The skills range from visual perceptual skills and spatial awareness, to early geometry concepts, visual motor integration, and fine motor skills. Authors Claire Heffron and Lauren Drobnjak, pediatric and physical therapists with years of experience in clinical and school-based settings, share their best tips and strategies for helping little learners reach their fullest potential through these engaging and fun activities.